David Booth didn't have the backyard rink or a legacy full of hockey players but growing up in Michigan, he fell naturally into the sport - and his talent didn't hurt either. 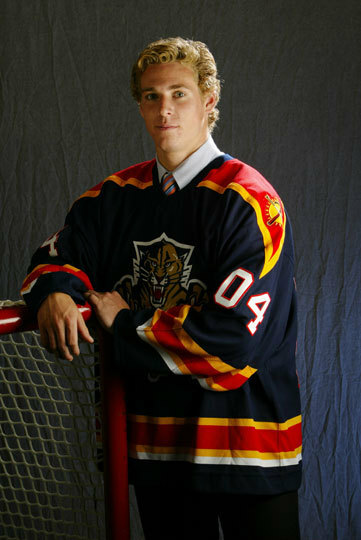 He's had a decorated career in international hockey for Team USA and played four years with the Michigan State Spartans before joining the Florida Panthers in the 2006-07 season. In his senior year, the Spartans went on the win the Mason Cup, awarded to the winner of the CCHA Men's Ice Hockey Tournament. 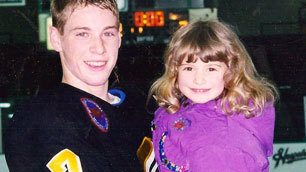 Since then, he's spent five seasons with the Panthers before arriving in Vancouver this year. He's come a long way from Fraser, Michigan to here. Booth shares his tales from his journey to the NHL. How old were you when you got your first pair of skates? Anywhere from 3-5. I can’t really remember. My dad keeps a lot of junk so he’d probably still have them. I’m sure I probably fell a lot when I was first learning to skate - I still fall a lot so I can’t imagine being any better when I was younger. How did you get into hockey? My dad put me in it. He never played organized or college hockey – he was just a fan but growing up in Michigan, that’s just what you did so it was a no-brainer. Funnily enough, my dad grew up on the backyard rink but I didn’t. Michigan was good though, because you could skate all over the place with rinks and frozen ponds all over the place. What is your earliest skating memory? My first concrete memory of something would’ve been skating with Steve Yzerman at the Fraser Ice Arena. I don’t even remember how old I was when that happened but I was just so excited to do it and getting to skate with him. What was your first hockey team? Fraser Falcons or the Detroit Honeybaked. Probably when I was 6 or 7. 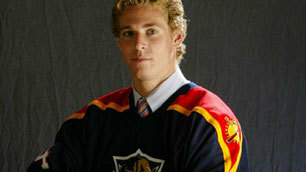 2004 NHL Entry Draft portrait. Booth was selected in the 2nd round (53rd overall) by the Florida PanthersThe only thing I really remember about playing then was playing with my cousin, Kenny, back in the day – he was a goalie. We loved playing in our basement, playing roller hockey, firing pucks with my brother and my cousin – that’s what I remember the most. My parents were good about us playing in the basement and not worried about us breaking things even though we broke the furnace a couple of times. What role did your family have in your career? I think they had the biggest role because they’re the ones that sacrificed the most – they sacrificed their time, their money, their happiness for the development of my hockey. They’re the reason I am, where I am. My home. I think I was there more than I was at home. Every weekend and after school, other than sleeping in bed, I was at the rink more than at my house. What is your proudest hockey moment? 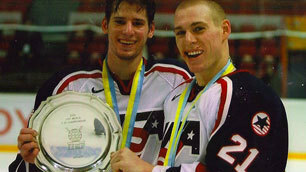 Winning the Under-18 World Championships in Slovakia in 2002 would be number one and number two would be winning the World Juniors in Finland in 2004. 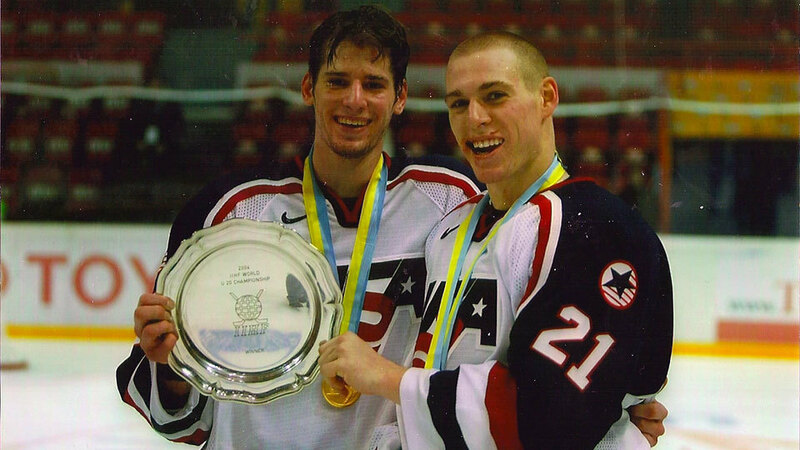 Booth and Ryan Kesler after winning the 2004 IHL World Junior Championships in Finland.In the Under-18 tournament, we were up 2-1 against Russia in the last minute of the game and you have to win by two goals in order to win the gold. If we won 2-1, we win silver, if we tied 2-2, we would’ve got bronze. We decided to pull our goalie with a minute left and tried to go for gold instead of settling for silver and maybe surrendering bronze. Zach Parise scored with 30 seconds left to win 3-1. I had the first two goals so I remember that really well. I remember Ovechkin and Semin were on that Russian team. I ended up being named MVP and got a watch that I gave to my dad. Who was your hockey hero growing up? I grew up a Red Wings fan so Steve Yzerman and Brendan Shanahan are the ones I looked up to a lot. They were easy picsk with me being a Red Wings fan and the team winning. What advice would you give someone aspiring to play in the NHL? Don’t put hockey number one. 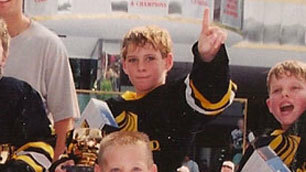 For me, I never put hockey number one – I always had other things going on in my life. Growing up, I would still play baseball and golf and other activities. I didn’t want hockey to be the only thing in my life and I wouldn’t do anything else because I think kids get sick of it and won’t pursue it later on in life. There’s people out there, who really enjoy it will do other things too and become a complete athlete. When you get to 18-19, is when you can start thinking about making sacrifices. When you’re growing up, don’t sacrifice other things for the sake of hockey. What was your biggest obstacle? "I grew up number 7 and then she grew up using number 7 because of that. And now I'm number 7 because of her. 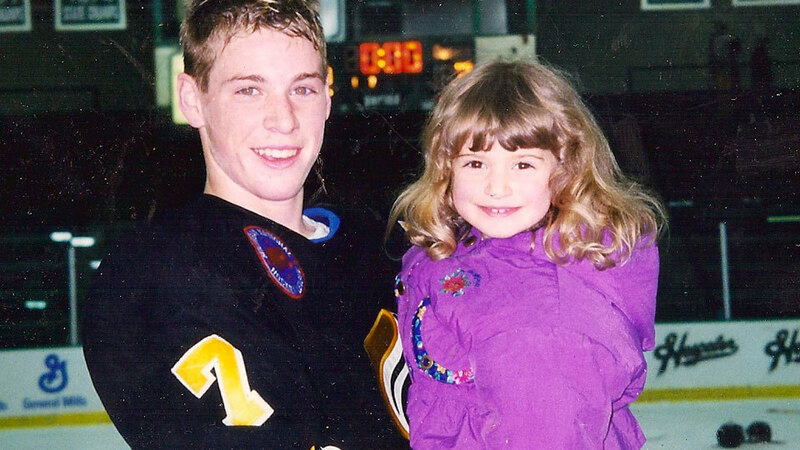 "The one I remember struggling with was whether I should go to the OHL or go to college. I didn’t really know. I talked to my dad and he really suggested I go to college because hockey doesn’t last forever and even if you play, it’s always going to end eventually and you always need to continue to learn and have an education. I kind of wanted to go to the OHL but looking back, I’m so thankful that I went to college and I strongly suggest kids go to college. I studied general management after switching from dentistry. I started school thinking I would do that because my dad was a dentist but I ended up with general management instead. Do you ever still get the feeling like this is unbelievable that you've made it here?